Great metal working cleanup tool! 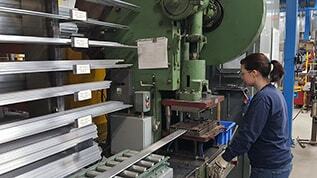 Control metal debris around manufacturing and industrial facilities. Magnetic Sweepers can be used at manufacturing and industrial facilities to pick up metal debris such as metal shavings, grindings, swarf, blanks from punch press operations, metal debris from equipment parts etc. 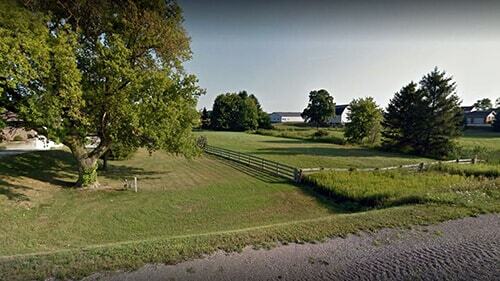 This type of metal needs to be cleaned up to keep the facilities operating effectively and safely. 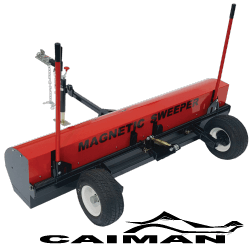 The right magnetic sweeper solution is different from facility to facility. 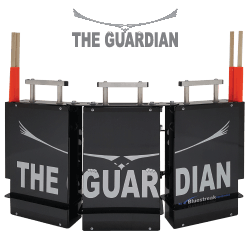 For some facilities a small handheld magnetic floor sweeper such as the Powerstik allows for cleanup in and around equipment and for other facilities a larger area needs cleaning and a tow behind model is necessary such as the Caiman or the Aardvark. Solutions for picking up metal debris. Hanging sweepers such as the Wrasse magnet bar are an extremely versatile solution for manufacturing facilities because they can be hung underneath equipment you already use to keep large areas free of debris as they go about their daily tasks. They can also be hung from the forks of forklifts for occasional use. 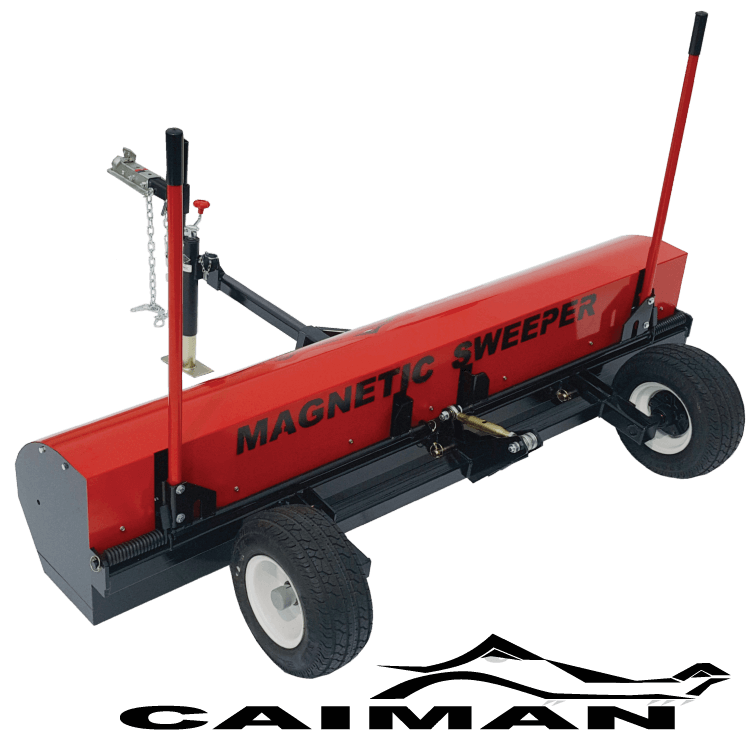 The new Forager magnetic sweeper is making waves as a manufacturing solution for picking up metal debris in the yard. This magnet attaches to the forklift rear pin. 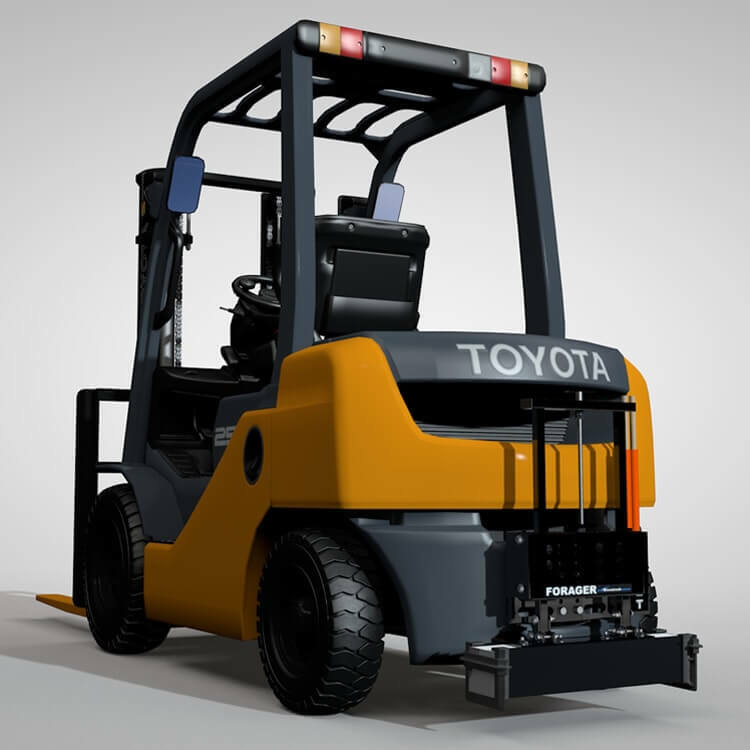 It moves with the forklift as it goes about the yard and fits like a glove to almost all makes and models of forklifts. 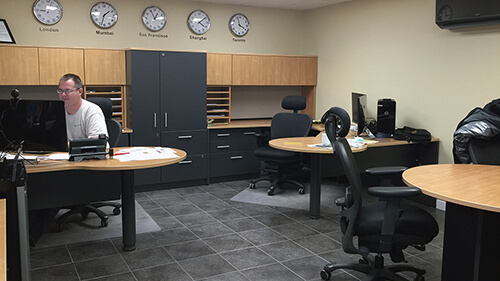 What do the staff of Bluestreak have to say on the subject of manufacturing facilitiy magnets? The cheapest way to get rid of debris is to avoid extra labor costs and to put a magnet on a vehicle or piece of equipment that is moving about the area all the time while working. Therefore consider the Wrasse or a forklift magnet like the Forager. The Powerstik magnet was added to the handheld magnet line in addition to the Tundra to meet the need for a handheld magnetic sweeper with superior access capabilities. This is a magnetic sweeper that can get places even the Tundra can’t due to it’s slim profile and awesome hook design. Gets in and around everything! Quick and easy clean off! The Aurora magnetic sweeper is designed for flat surfaces and features a easy clean off system. The debris release handle lifts the magnetic housing out of the tray. The debris then drops off the bottom of the sweeper, no lifting or bending over. 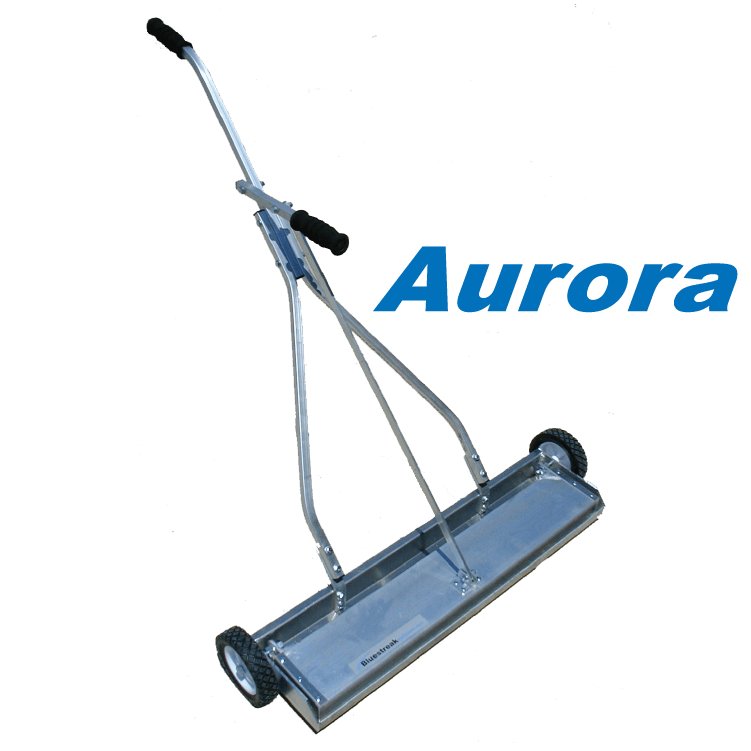 The Aurora magnetic floor sweeper is the perfect balance for a commercial manufacturing shop environment with just the right features and just the right power with medium pick up power. 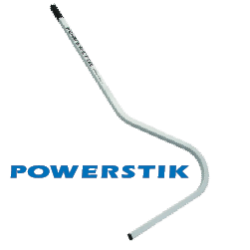 It’s also available in a narrower 19 inch sweeping width to manoeuver around shop equipment in a smaller shop environment. Ready to handle manufacturing metal debris. The Bora magnetic sweeper is the biggest flat surface magnet with loads of power, a wider width and features like the debris release handle. 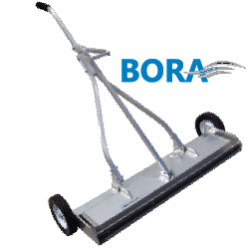 The Bora magnetic floor sweeper is the biggest magnet we make in a push type sweeper for flat surfaces, with two layers of C8 ceramic magnets packed end to end, un-spaced and a steel backing plate to make the magnetic field larger and extend it downward. 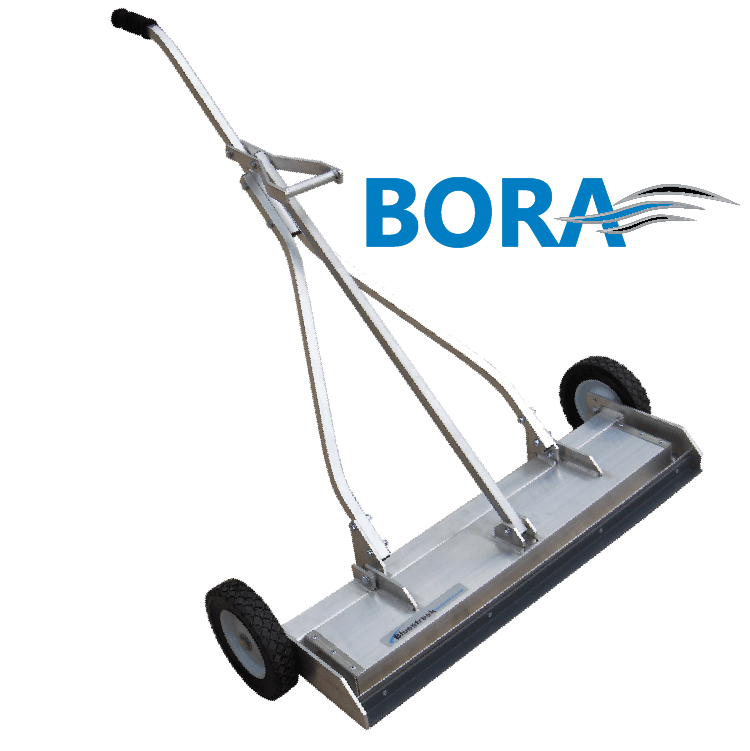 The Bora is designed for flat surfaces where there is no grass, dirt or uneven surfaces. Built for Durability and Versatility! 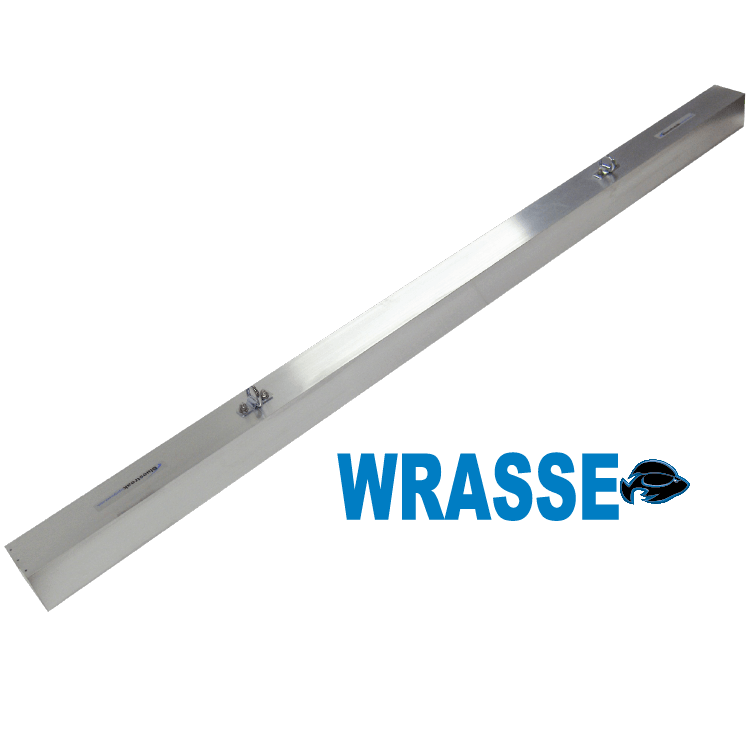 The Wrasse magnet bar is as versatile as it gets. 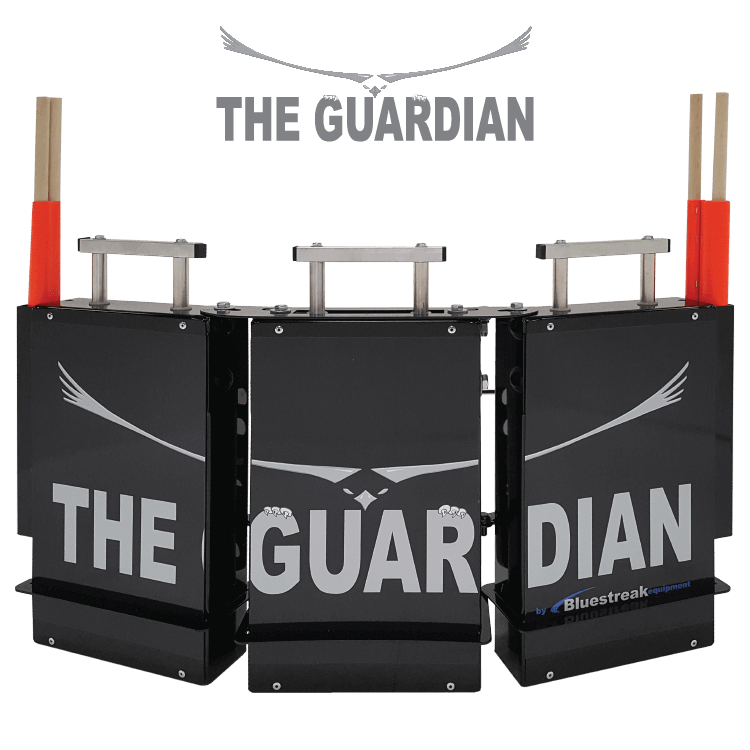 Simply hang the Wrasse in front, at the rear or under your equipment. it comes standard with 2 hanging chains. Hang it from almost any piece of equipment and as long as the ground is fairly even so that the magnet doesn’t hit the ground all the time they function very well allowing the equipment operators to clean environments while they do their normal tasks. Add the fork Pocket Accessory kit and convert the Wrasse magnet bar into a forklift mounted magnet. The Yacare magnetic sweeper is a 72 inch wide, durable off road tow behind magnetic sweeper with Spring Assisted Debris Clean Off system that makes cleaning off the magnet quick and easy! 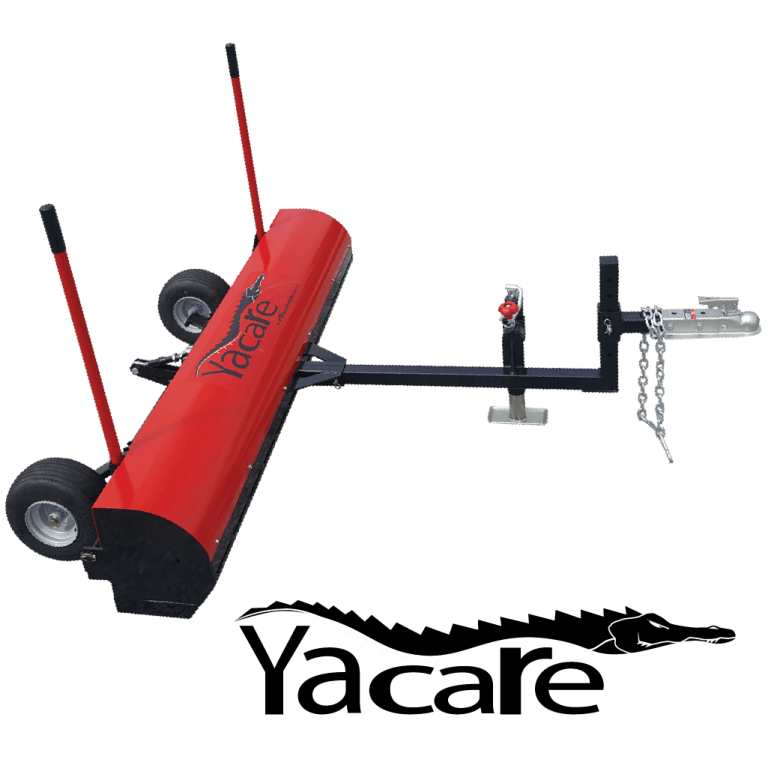 The Yacare has power and advanced durability provided by the all steel and stainless steel construction and easy effortless clean off with dual Spring Assisted Debris Release levers. Yacare also has good pick up performance in off road conditions provided by the “wrap around” design, the adjustable sweep height, flat proof tires, adjustable hitch height and optional Debris Digging Rake accessory. The Caiman magnetic sweeper is one step up from the Yacare magnetic sweeper. The Caiman is like the Yacare because it has enclosed magnets and the Dual Spring Assisted Debris Release Handles. However, the Caiman is wider at 82 inches and has more pickup power with 50% more magnets than the Yacare. More pickup power and wider sweeping width make the Caiman a good choice for towing behind pickup trucks and UTVs that operate around manufacturing facilities. 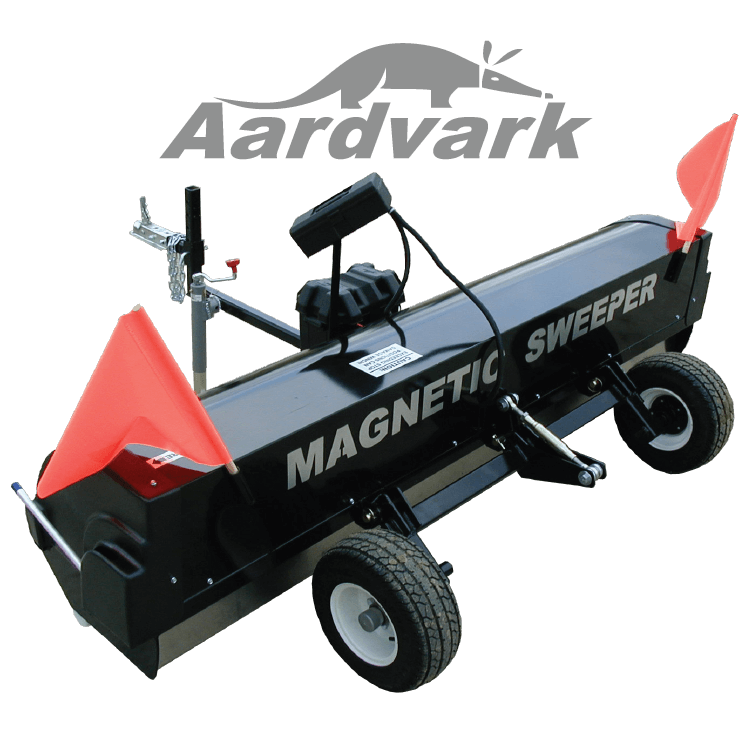 Fully enclosed automatic magnetic sweeper! The Aardvark magnetic sweeper easily tows behind trucks or utility vehicles to sweep large industrial sites. Fully enclosed magnet means you don’t have to worry about metal getting all over the magnet. Easy to clean off with a push of a button! The Aardvark has the “Wrap Around” feature which prevents debris from falling off once picked up due to ground strikes, dirt or grass pushing the debris backward on the magnet and off the back. Instead of the debris falling off the back when pushed backward, the debris just “wraps around” onto the back side of the magnet. 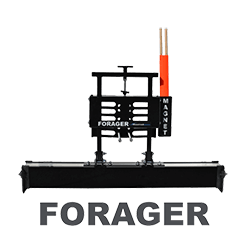 The Forager magnetic sweeper utilizes the rear pin on your forklift as the mounting point and the Forager mounting bracket is vented to ensure the pin mount can be used even if the exhaust on your forklift is vented through the pin slot. No modifications to your forklift are necessary to mount the Forager. The mounting bracket uses the existing pin on your forklift ONLY. 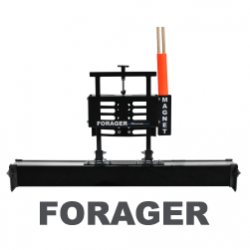 There is no need to modify, weld on or drill into your forklift in order to mount the Forager. This slim profile is specifically designed for forklifts that need to maintain maximum manoeuverability and/or need to work around tight, congested areas around manufacturing facilities. 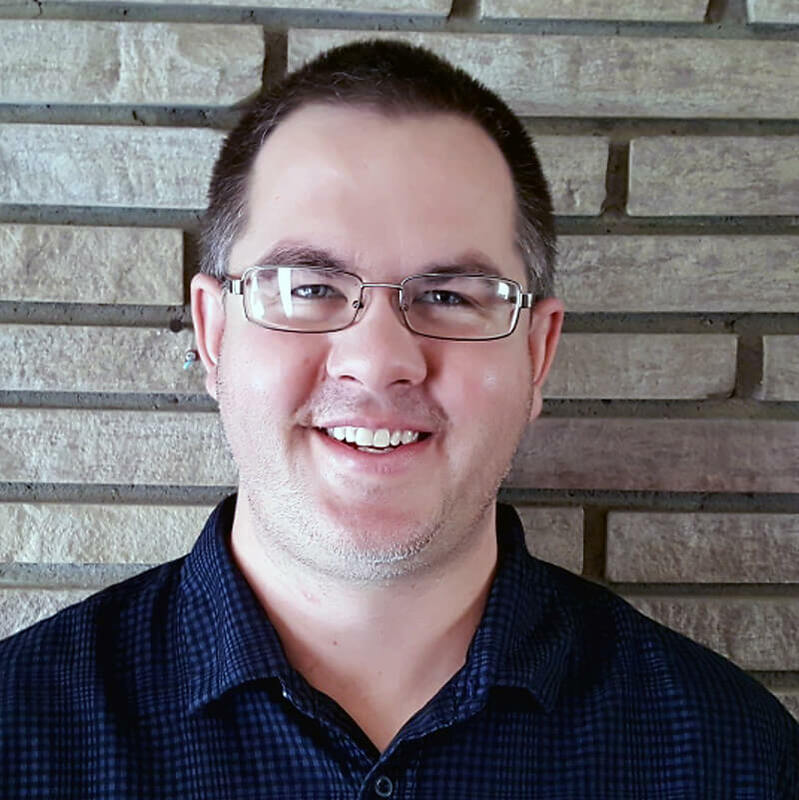 Maximum Lifting Height 9 3/4" 10 1/2" 7 1/4" 2" 4 1/2" 5 3/4" 4 3/4" 6" 8 1/2" 12" 8 1/2"
Sweeper Widths 72" 82" 33" 12" 19", 25", 31" 25", 31", 37" 26", 38", 50", 62", 74", 86", 98" 26", 38", 50", 62", 74", 86", 98" 26", 38", 50", 62", 74", 86", 98" 96" 26" , 32", 38", 44", 50"